Most authentication systems are black and white, once you are in , you are in. It was brought our attention recently, that authentication should be an ongoing process, not a one time gate with continuous unchecked free rein once in. The reasons are well founded. 1) Students at universities and employees at businesses, have all kinds of devices which can get stolen/borrowed while open. My high school kids can attest this many times over. Often the result is just an innocuous string of embarrassing texts emanating from their phones claiming absurd things. For example ” I won’t be at the party, I was digging for a booger and got a nose bleed” , blasted out to their friends after they left their phone unlocked. This leaves a hole in standard authentication strategies . Next year we plan to add an interesting twist to our Intrusion Detection Device ( NetGladiator). The idea was actually not mine, but was suggested by a customer recently at our user group meeting in Western Michigan. The idea for our intrusion detection device would be to build a knowledge base of a user’s habits over time and then match those established patterns against a tiered alert system when there is any kind of abrupt change. It should be noted that we would not be monitoring content, and thus we would be far less invasive than Google Gmail ,with their targeted advertisements, we would primarily just following the trail or path of usage and not reading content. The heuristics would consist of a three-pronged model. Prong one, would look at general trending access across all users globally . If an aggregate group of users on the network were downloading an IOS update, then this behavior would be classified as normal for individual users. Prong two , would look at the pattern of usage for the authenticated user. For example most people tune their devices to start at a particular page. They also likely use a specific e-mail client, and then have their favorite social networking sites. String together enough these and you would develop unique foot print for that user. Yes the user could deviate from their pattern of established usage as long as there were still elements of their normal usage in their access patterns. Prong three would be the alarming level. In general a user would receive a risk rating when they deviated into suspect behaviors outside their established baseline. Yes this is profiling similar to psychological profiling on employment tests, which are very accurate at predicting future behavior. A simple example of a risk factor would be a user that all of sudden starts executing login scripts en masse outside of their normal pattern. Something this egregious would be flagged as high risk, and the administrator could specify an automatic disconnection for the user at a high risk level. Lower risk behavior would be logged for after the fact forensics if any internal servers became compromised. Enjoy another issue of NetEqualizer News! This month, we discuss AD integration into NetEqualizer, the results of our recent Educause conference, and new NetEqualizer features coming in 2013. As always, feel free to pass this along to others who might be interested in NetEqualizer News. Spring is almost upon us, and yet in Colorado it is just starting to feel like winter. We get our snowiest weeks typically in late February and early March. So far for this year, that is proving to be true. However, with spring coming soon we look forward to beginning again! We are already in the process of implementing exciting new features for our first Software Update of 2013! – 64 Bit Processing: This change will allow current customers to operate on existing hardware and attain 20 to 50 percent improvements in performance. – Sortable Active Connections Table: You will now be able to sort the Active Connections table by any of the columns you choose. – Caching Service Updates: We will be updating and expanding our available caching services. – Port-Based Equalizing: Check out our blog article on bandwidth management on the public side of a NAT router. – Active Directory Integration: Now, administrators will be able to see AD user names in their Active Connections table. Check back with NetEqualizer News for updates on each of these new features and their scheduled releases! Remember, new software updates (including all the features described above – except AD Integration) are available for free to customers with valid NetEqualizer Software & Support (NSS). If you are not current with NSS, contact us today! Sandy had a great time at the West/Southwest Regional Educause Conference in Austin February 12-14th, 2013! 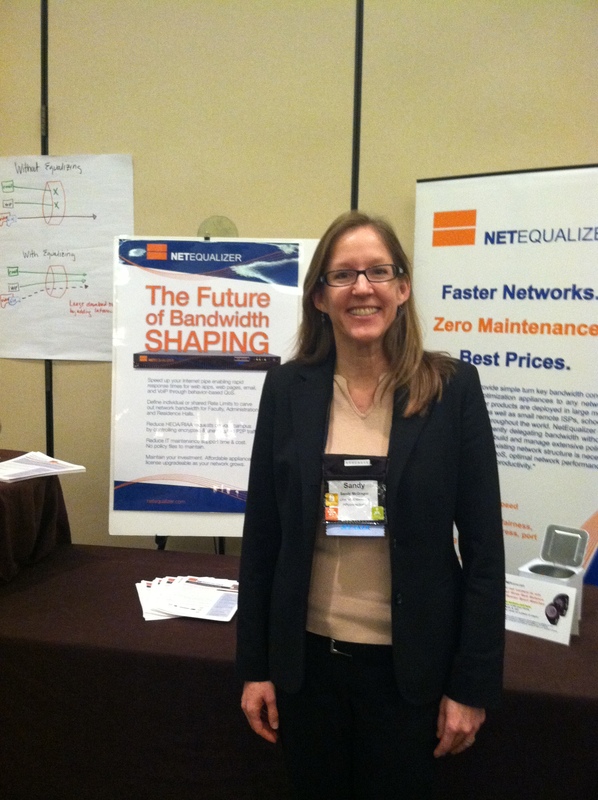 Sandy talked about the “Future of Bandwidth Shaping” with the attendees. One professor, who also runs a ISP for colleges, even came from South Africa! Most of you know that NetEqualizer is the future of bandwidth shaping, but if you need to convince anyone else (your boss, the powers that be, etc. ), we recommend printing out our updated 1-2 page Executive White Paper and sharing that. If you are in Higher Education, you can also check out our newly revised College & University Guide. Stay tuned to NetEqualizer News for updates on upcoming conferences! We are close to releasing our new Active Directory integration feature and are nearing the end of our beta tests! Thanks to all of those organizations that have helped us out thus far. As an additional note, because Active Directory is a complicated environment which varies from customer to customer, the AD Integration feature will be an additional charge beyond NSS. This fee will include support in getting you up and running with the new feature. 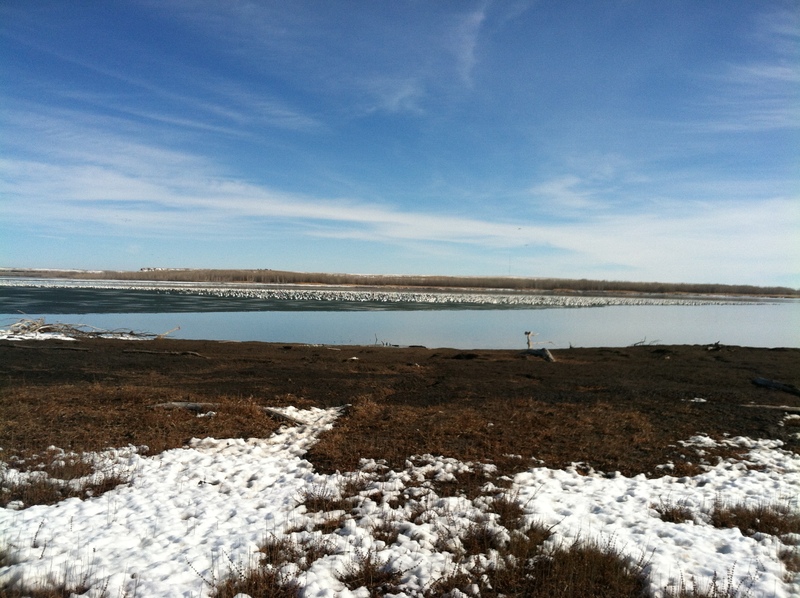 If you look closely at the lake you can see a gaggle of white Snow Geese in the water. Though they typically live in colder climates, they’ll come to warmer states in the winter to breed. This photo was taken in Kansas on a recent trip by one of our staff members. A few months ago we introduced our NetGladiator Intrusion Prevention (IPS) Device. To date, it has thwarted tens of thousands of robotic cyber attacks and counting. Success breeds success and our users wanted more. When our savvy customers realized the power, speed, and low price point of our underlying layer 7 engine, we started getting requests seeking additional features such as: “Can you also block Peer To Peer and other protocols that cannot be stopped by our standard Web Filters and Firewalls?” It was natural that we extended our IPS device to address this space; hence, today we are announcing the next-generation NetGladiator. We now offer a module that will allow you to block and monitor the world’s top 10 p2p protocols (which account for 99 percent of all P2P traffic). We also back our technology with our unique promise to implement a custom protocol blocking rule with the purchase of any system at no extra charge. For example, if you have a specific protocol you need to monitor and just can’t uncover it with your WebSense or Firewall filter, we will custom deliver a NetGladiator system that can track and/or block your unique protocol, in addition to our standard p2p blocking options. 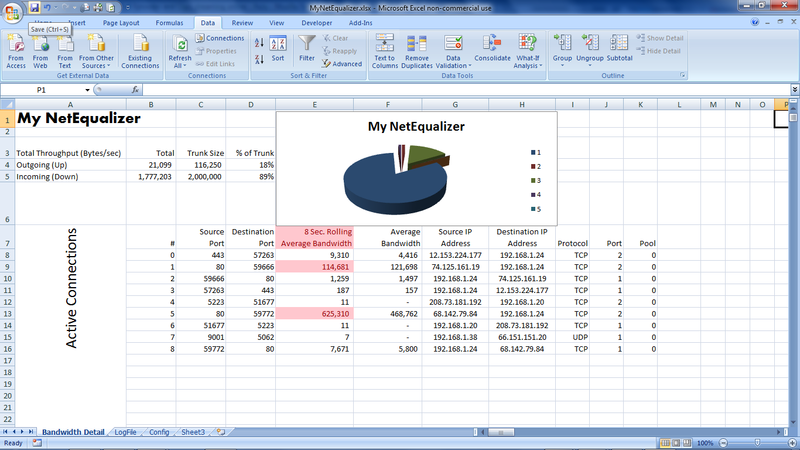 Below is a sample Excel live report integrated with the NetGladiator in monitor mode. On the screen snapshot below, you will notice that we have uncovered a batch of Utorrent and Frost Wire p2p traffic. Please feel free to call 303-997-1300 or email our NetGladiator sales engineering team with any additional questions at ips@@apconnections.net. The spread sheet reporting features described below as an excel Integration have now been integrated into the NetEqualizer GUI as of 2013. We have also added protocol reporting for common applications. We generally do not break links to old articles hence we did not take this article down. 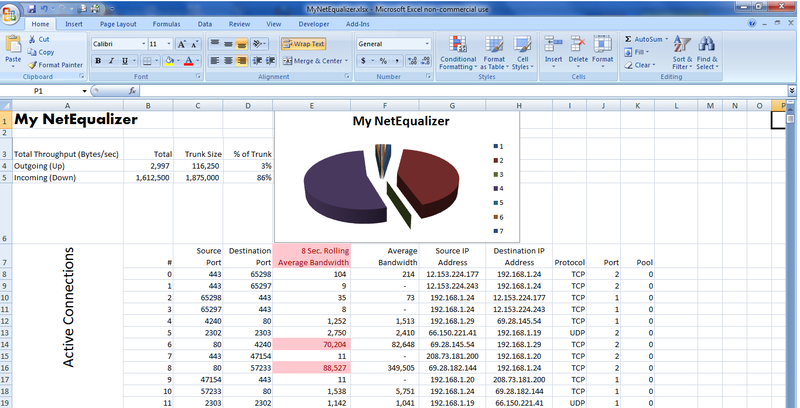 The following excel integration, totally opens up the power of the NetEqualizer bandwidth data. Even I love watching my NetEqualizer data on my spreadsheet. Last night, I had it up and watched as the bandwidth spiked all of a sudden, so I looked around to see why it was – turns out my son started watching NetFlix on his Nintendo DS! Too funny, but very persuasive in terms of enhancing your ability to do monitoring. This blog shows just one example, but suffice it to say that the reporting options are endless. You could easily write a VBA routine in Excel to bring this data down every second. You could automatically log the days top 10 highest streams, or top 10 highest connections. You could graph the last 60 seconds (or other timeframe) of per second peak usage. You could update this graph, watching it scroll by in real time. It’s endless what you could do, with relatively little effort (because Excel does all the computationally hard work as pre-programmed routines for reporting and display). Pretty slick eh? After I put this spreadsheet together the first time, I won’t have to do anything to have it report current data every minute or sooner. Let me explain how you can do it too. 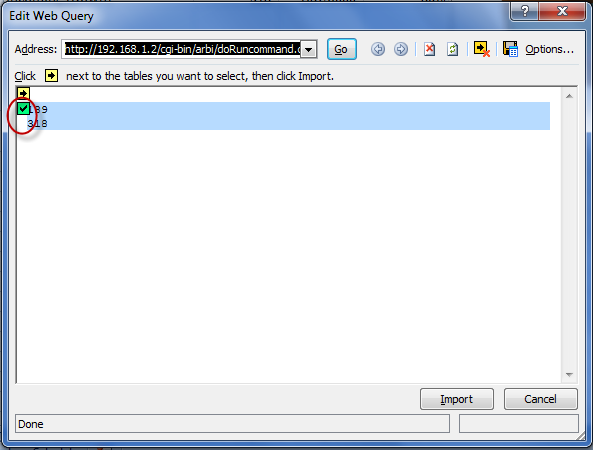 Did you know that there’s a little known feature in Microsoft Excel called an Excel Web Query? 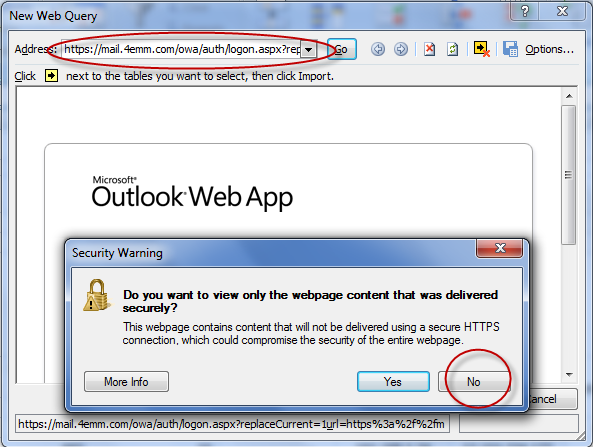 This facility allows you to specify an http: address on the web and use the data off the resulting web page for automatic insertion into Excel. 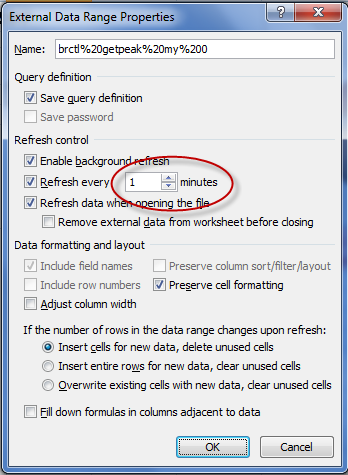 Further, you can tell Excel that you want your spreadsheet to be automatically updated regularly – as frequently as every minute or whenever you hit the “Refresh All” key. If you combine this capability with the ability to run a NetEqualizer report from your browser using the embedded command, you can automatically download just about any NetEqualizer data into a spreadsheet for reporting, graphing and analysis. Fig-1 above shows some interesting information all of it gathered from my NetEqualizer as well as some information that has been programmed into my spreadsheet. Here’s what’s going on: Cells B4 & B5 contain information pulled from my NetEqualizer, it is the total bandwidth Up & Down respectively going through the unit right now. It compares this with cells C4 & C5, which are the TrunkUp & TrunkDown settings (also pulled from the NetEqualizer’s configuration file and downloaded automatically) and calculates cells D4 & D5 showing the % of trunk used. The Cells B8:K show all the data from the NetEqualizer’s Active Connections Report. The column titled “8 Second Rolling Average Bandwidth” shows Wavg and this data is also automatically plotted in a pie chart showing the bandwidth composition of my individual flows. Also, I put a conditional rule on my bandwidth flow that says because I’m greater than 85% of my TrunkDown speed, all Flows greater than HOGMIN should be highlighted in Red. All of this updated every minute, or sooner if I hit the refresh key. I’ll take you through a step by step on how I created the page above so you unlock the power of Excel on your critical bandwidth data. The steps I outline are for Excel 2007, this can be done in earlier versions of Excel but the steps will be slightly different. All I ask is if you create a spreadsheet like this and do something you really like, let us know about it (email: sales@apconnections.net). I’m going to assume that you know how to construct a basic spreadsheet. This document would be far too long if I took you through each little step to create the report above. Instead, I’ll show you the important part – how to get the data from the NetEqualizer into the spreadsheet and have it automatically and regularly refresh itself. In this page there are two links: One at B4:B5, and another at B8:K (K has no ending row because it depends on how many connections it pulls – thus K could range from K8 to K99999999 – you get the idea). Select cell B4 with your cursor. Select the “Data” tab and click “From Web”. You may get asked for your User ID and Password – just use your normal NetEqualizer User ID and Password. Click on the 2nd arrow in the form which turns it into a check mark after it’s been clicked (as shown in the picture above). This highlights the data returned which is the “Peak” bandwidth (Up & Down) on the NetEqualizer . Click the Import button. 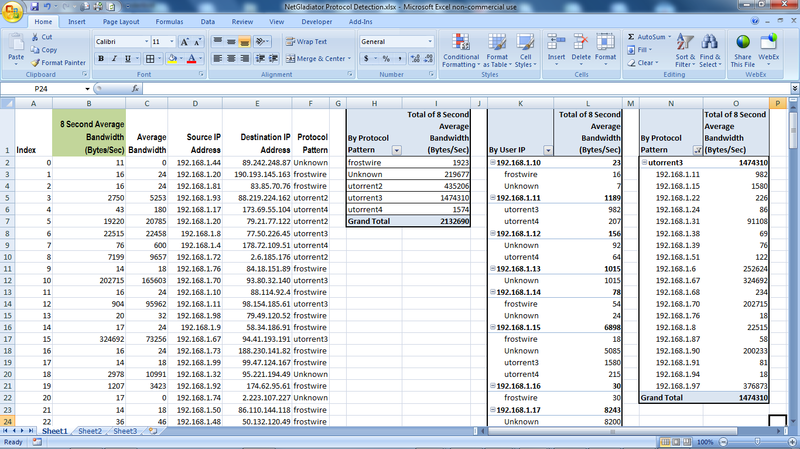 In a few seconds this will populate the spreadsheet with this data in cells B4 & B5. 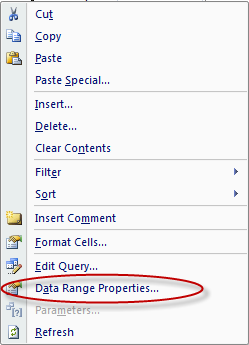 Click on Data Range Properties. Change “Refresh every” to 1 minute. Also, you should copy the other click marks as well. Hit “OK”. Done! Total Bandwidth flow data from the NetEqualizer bridge will now automatically update into the spreadsheet every 60 seconds. Also, please copy and paste this exactly (unless you’re a Linux expert – and if you are send me a better command!) since there are many special formatting characters that have been used to make this import work in a well behaved manner. Trust me on this, there was plenty of trial an error spent on getting this to come in reliably. Also, remember to set the connection properties to update every 1 minute. At this point you may be noticing one of the cool things about this procedure is that I can run my own “custom” reports via a web http address that also issues Linux commands like “cat” & “awk” – being able to do this allows me to take just about any data off the NetEqualizer for automatic import into Excel. Once you get all the data you need into your Excel, you can operate on the data using any Excel commands including macros, or Excel Visual Basic. Caveat – this feature is unsupported by APConnections. In this month’s newsletter, we gave an overview of a few potential new NetEqualizer features. While we have several options under consideration, we want to know what features might serve you best. So, take a look at the options below, visit our survey, and let us know what you think! The option to send an SNMP trap to your SNMP monitor during a network event. A form of active directory integration to specify a rate limit on a user by name rather than IP address. For example, you could say John Smith is limited to one-megabit downloads. As of now, you would need to know John Smith’s IP address. With an integration of active directory, you can specify him by name. A standard pre-written quota utility (source code) with each system. Right now, the NetEqualizer just comes with an API (see the NetEqualizer User Quota API). However, this new utility would be something you could plug IPs into from the GUI and have a monthly quota enforced right away. Initially, it would be a very simple tool, but it could be expanded. In other words, this would be a good working program using our API to get you a head start on expanding and writing a full-bodied quota tool. Click here or on the survey to respond.